For most print publishers, mapping the audiences for their various titles would yield a cluster of overlapping circles — many readers of one of the publisher’s titles also read at least one other title. This is particularly true in trade publishing (magazines and books), where publishers often have multiple titles within a vertical, but it is also true of newspaper companies that publish many papers within a larger region. For these publishers, mapping readers’ interest in content across their vertical titles would yield a similar cluster of overlapping circles, as few readers are interested in ALL the content across ALL titles, but rather SOME content across SOME titles. Publishing was a great business because you could sell the WHOLE package (title) even though readers only valued PART of the package (articles), and you could get readers to buy multiple packages even though what would really serve them best was a single package with exactly the content they wanted. On the web, of course, all that has changed. Publishing online has become much more reader-centric, where smart publishers are now unbundling the old content packages that were defined by print titles, pouring all the content into one big bucket, and allowing readers to access that content by topic or through search. These publishers are not throwing out the print brands, as they still have great value (e.g. trust, authority), but they are allowing each article to stand on its own and be part of many different content packages. In short, to quote David Weinberger, these niche publishers are finding that all of their content is miscellaneous. That broader business focus includes partnering with traditional competitors, including CMP, which is offering its Search Medica search tool to ModernMedicine.com, as well as Quadrant, which is offering a CME planning tool. “People recognize they may not have the assets to build something this big but maybe they can partner with us and get a revenue share,” says Morris. 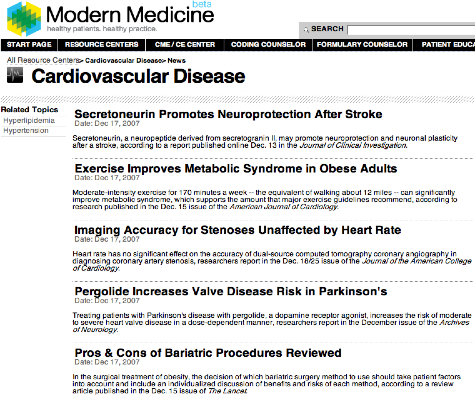 For example, here is a list of articles from the Diabetes Resource Center — notice how the print brands are still highlighted, but the content has been completely repackaged by topical focus. 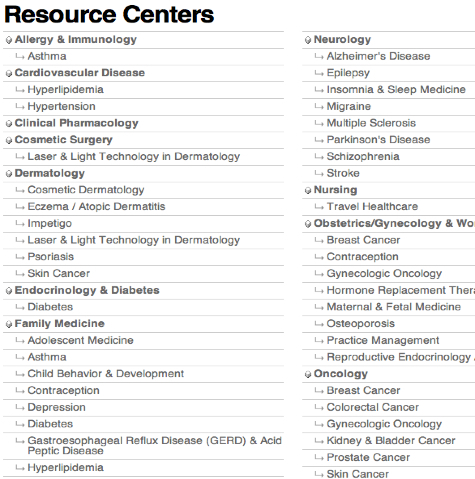 Of course, users are not limited to these fixed Resource Center topics — they can easily search across all of the content by any keyword, e.g. diabetes treatments. The inclusion of third-party content is a radical step from a traditional publishing perspective but makes perfect sense from this new user-centric perspective. Rather than asking users to subscribe to every publication, Advanstar is wisely asking them to register only once and then leverage that user data across the the entire site. What’s really striking is how much more user-friendly this approach is, particularly for a general title like Patient Care, which is probably relevant to all physicians but only some of the time. 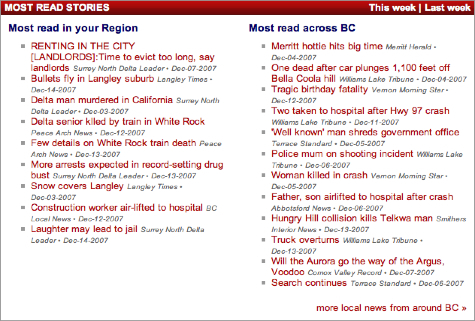 Comprised of four of British Columbia’s major newspaper regions – B.C. North, B.C. South, Vancouver Island and the Lower Mainland – Black Press B.C. 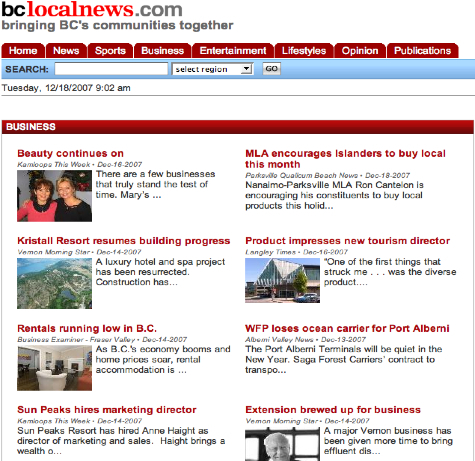 serves small communities like Barriere and Sooke as well as the province’s major urban centres. With a Safari Library subscription, you receive unlimited access to all content types within Safari Books Online’s growing digital collection – books, manuscripts in progress, certification guides, online video courses, and more. Among Safari’s innovations is providing access to “pre-published manuscripts on advanced technologies, updated as the author writes the book” — inconceivable in the world of print publishing. These are just a few examples of print publishers who are blowing up the old content packages, which were based on distribution models that best served the PUBLISHERS, to create new dynamic packages that best serve READERS.